I took an early evening bike ride on Thursday, this time southeast from Greifswalder Strasse along Danzinger, which functions sort of like a ring road. Danzinger turns into Petersburger Strasse, and as I approached Frankfurter Tor, I noticed a couple of good-looking stickers on an electrical pole, but as I got closer, I could see they were covered with paint. Looking around further, I saw a storefront with shattered and taped up windows, and in fact, the entire building façade and sidewalk below had been splashed with several layers of pink paint. 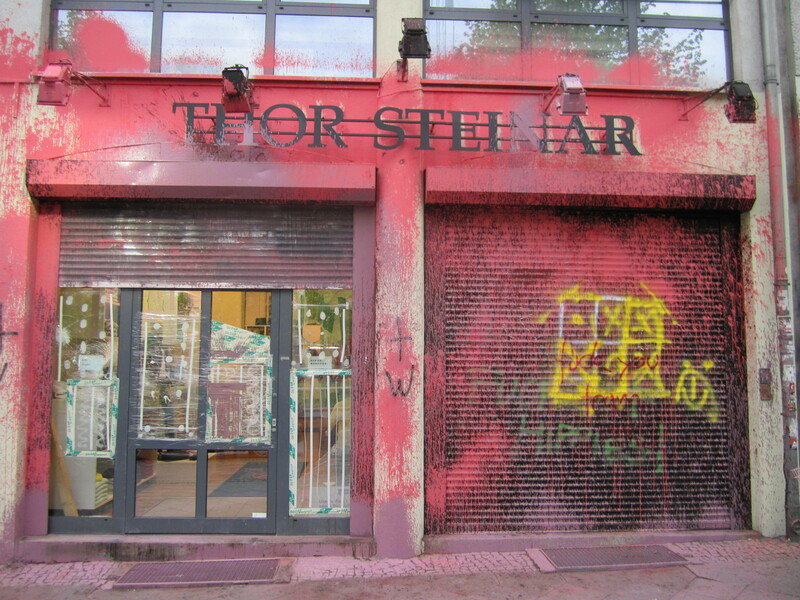 The shop was a Thor Steinar outlet, a right-wing company that has been criticized for what has been labeled a neo-Nazi clothing line. You can see pictures from a protest demo in late February 2012 here. 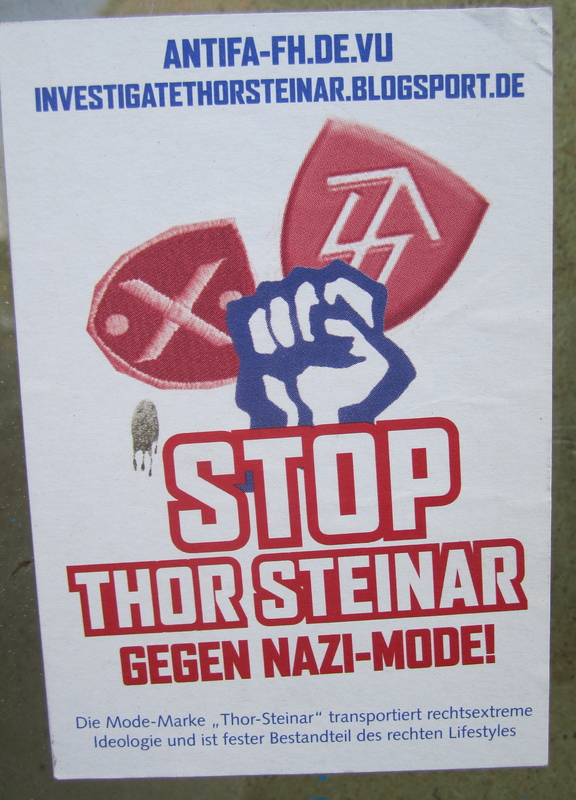 I wrote about Thor Steinar in 2009 (though I didn’t have any stickers to show then), and given the controversy at the time, I thought the store in Berlin had been closed. Turns out the store in Mitte had shut down (the one I wrote about in 2009) and moved east to Friedrichsain district. I was surprised to see it yesterday at its location near the Warschauer Strasse U-bahn. That part of town has always been difficult for me to figure out. A lot of commuters were coming off trains, so it was busier than usual. But there were also groups of young hippies and punks who were loitering around, drinking, getting ready to party, it seemed. Everything was fine, but I didn’t linger. Thor Steinar recently ran afoul again in the east German city of Chemnitz with an outlet store called Brevik, which to many sounds too overtly similar to the mass murderer Anders Behring Breivik of Norway. I won’t go into detail, but you can read about it here. On the other side of protest, yesterday my friend Nada showed me a few commercial storefronts in central Mitte that had been stoned by lefties protesting capitalism and gentrification. I’ll get their company names and add info to this post later. Lots of protests in Berlin these days, including one in the dark last night with a few hundred people on bikes and cops trailing in cars behind. An “eco-protest,” I was told.